I should not be surprised some people were so gullible to swallow this end of the world prophecy. It just proves that idiots aren’t limited to and don’t work only in Washington, DC. Boehnor’s “Plan B” flopped. It was withdrawn unexpectantly last night when House ‘Pub leaders realized they didn’t have enough votes for passage. According to some sources, Boehner is in danger of losing his Speakership. To counter these reports, Boehner and his surrogates are touring the media outlets this morning denying the danger. It makes you wonder if there was no danger, why is Boehner, et. al., going to so much trouble denying it? Amid reports and rumors of the bad old days of the assault weapons ban, Wal-Mart sold out of their stock of AR type rifles and their magazines in a several mid-western states including Kansas. Another well-known supplier of firearm components exhausted their supply of magazines as well. Brownells, the world’s largest supplier of firearms, has reportedly sold three-and-a-half years worth of magazines in just seventy-two hours. — CNS News. It’s enough to make me consider getting a second AR. Perhaps a M4 style this time. Governor Cuomo of New York says the state is “considering” gun confiscation and more gun control. The libs may think they could do that in New York, although I think they’ll have strong resistance in the northern and western portions of the state. It wouldn’t fly anywhere else outside of the Rust Belt and the Left Coast. There’s a reason why Molon Labe is well known throughout the country. 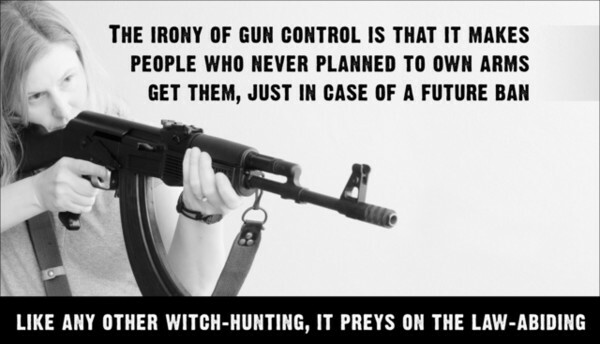 The libs continue to forget that SCOTUS has declared the 2nd Amendment is a personal right. That ruling also blocks any confiscation scheme the libs may devise. You can’t have a right if the state removes the tools of that right from the people. On the other hand, the dems and liberal groups don’t let a small thing like the Constitution stand in the way of their plans to seize more and more power at the expense of our liberty.